Fetch the current configuration with the GET services anomaly detection configuration call. Update the current configuration with the PUT services anomaly detection configuration call. You can also manage the same configuration in the Dynatrace UI at Settings > Anomaly detection > Services. Gets the configuration of anomaly detection for services. Dynatrace automatically detects service-related performance anomalies such as response time degradations and failure rate increases. Use these settings to configure detection sensitivity, set alert thresholds, or disable alerting for certain services. How to detect response time degradation. How to detect failure rate increase. Configuration of failure rate increase detection. How to detect failure rate increase: automatically, or based on fixed thresholds, or do not detect. Parameters of automatic failure rate increase detection. Required if detectionMode is DETECT_AUTOMATICALLY. Not applicable otherwise. The absolute and relative thresholds both must be exceeded to trigger an alert. Fixed thresholds for failure rate increase detection. Required if the detectionMode is DETECT_USING_FIXED_THRESHOLDS. Not applicable otherwise. Required if detectionMode is DETECT_USING_FIXED_THRESHOLDS. Not applicable otherwise. Failure rate during any 5-minute period to trigger an alert, %. With low sensitivity, high statistical confidence is used. Brief violations (for example, due to a surge in load) won&apos;t trigger alerts. With high sensitivity, no statistical confidence is used. Each violation triggers alert. Parameters of failure rate increase auto-detection. Required if detectionMode is DETECT_AUTOMATICALLY. Not applicable otherwise. The absolute and relative thresholds both must exceed to trigger an alert. Absolute increase of failing service calls to trigger an alert, %. Relative increase of failing service calls to trigger an alert, %. Configuration of response time degradation detection. How to detect response time degradation: automatically, or based on fixed thresholds, or do not detect. Parameters of automatic response time degradation detection. Violation of any criterion triggers an alert. Fixed thresholds for response time degradation detection. Response time during any 5-minute period to trigger an alert, in milliseconds. Response time of the 10% slowest during any 5-minute period to trigger an alert, in milliseconds. Minimal service load to detect response time degradation. 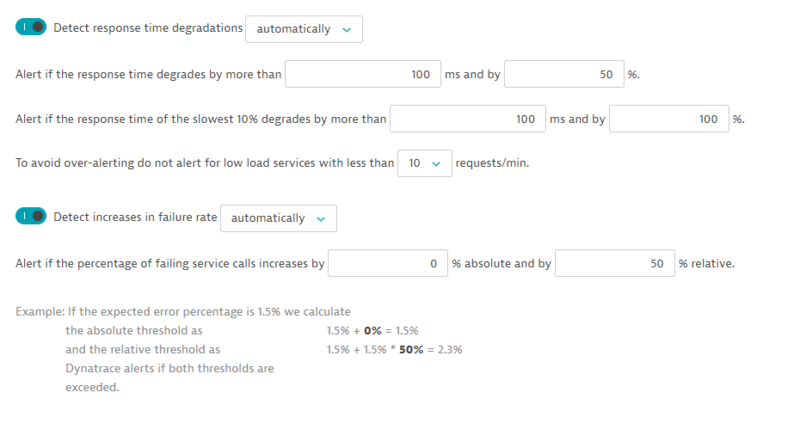 Response time degradation of services with smaller load won&apos;t trigger alerts. With high sensitivity, no statistical confidence is used. Each violation triggers an alert. Parameters of the response time degradation auto-detection. Required if the detectionMode is DETECT_AUTOMATICALLY. Not applicable otherwise. Alert if the response time degrades by more than X milliseconds. Alert if the response time degrades by more than X %. Alert if the response time of the slowest 10% degrades by more than X milliseconds. Alert if the response time of the slowest 10% degrades by more than X %. In this example, the request lists the current configuration of anomaly detection for services. Updates the configuration of anomaly detection for services. The JSON body of the request. Contains parameters of the service anomaly detection configuration. Alert if 3% of custom failure rate threshold is exceeded during any 5-minute period. You can download or copy the example request body to try it out on your own. Be sure to create a backup copy of your current configuration with the GET services anomaly detection configuration call. Validates the payload for the PUT service anomaly detection configuration request. 204 Validated. The submitted configuration is valid. Response doesn&apos;t have a body. In this example, the request validates the update for the PUT request example. The response code 204 indicates that the updated configuration is valid, so you can submit it to the environment.